I started feeling sympathy for this girl I had never actually met, and only interacted with in the form of “likes” and Instagram comments. 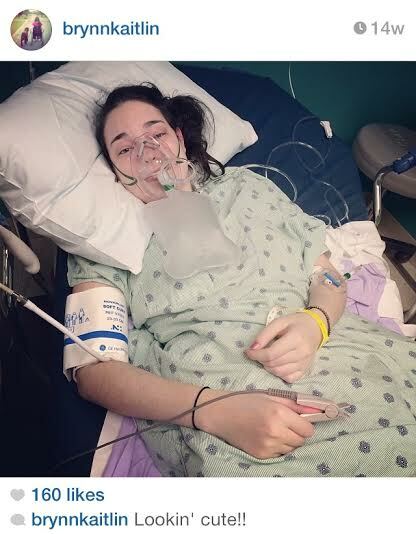 The more I read about her constant anaphylactic reactions, hospital visits, feeding tubes, and seizures, the more curious I became about what type of illness she was dealing with. As someone who has anaphylactic allergies and knows the physical, mental, and emotional toll they take on a person, I could hardly comprehend a disease that causes spontaneous anaphylaxis, sometimes several times per day. 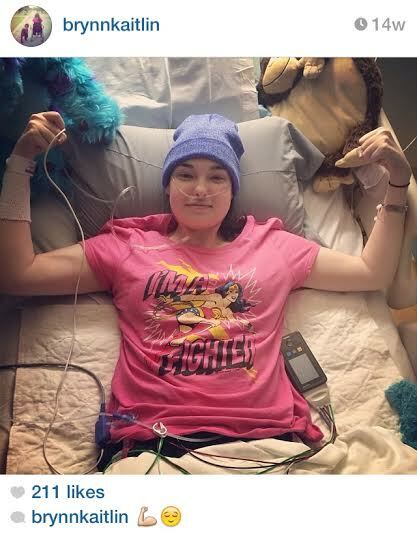 I reached out to Brynn in a private message asking if she would be interested in letting me interview her about her condition, which I learned was called Mast Cell Disease. She eagerly agreed in hopes of spreading awareness about this chronic, life-threatening, and currently incurable disease. I expected our interview to be relatively short, straightforward, and purely informational, but five minutes into our first conversation, I knew it was going to be none of the above. Brynn Duncan would be one of the most interesting influential people I had the honor of meeting. I learned so much from her. Brynn’s stories and perspective had a profound and what I’m sure will be a lifelong impact on me. By the end of our multiple conversations, which she squeezed in between Emergency Room visits and feeding tube surgeries, I was just as fascinated with her as a person as I was about the actual rare disease itself, which only about 150,000 people have been diagnosed with to date. Her overwhelming optimism and acceptance of a tragic, life-altering disease was inspiring, to say the least. From her hospital bed, Brynn smiled and giggled as we exchanged anaphylaxis stories and food allergy woes over video chat. I feel honored to have been given a glimpse into the world of Brynn Duncan, a young woman whose disease has limited her physically, but has empowered her mentally and spiritually in unimaginable ways. Can you familiarize us with Mast Cell Disease (MCD)? Mast cells are cells in our blood that are responsible for histamines, like what causes allergic reactions and what happens when we get mosquito bites. In my body, they are constantly releasing so it’s like I’m having an allergic reaction all the time, that’s the simplest way to put it. I’ve had symptoms since being a newborn but it didn’t get really bad until I was 16 years old, and I’m 20 now. We were actively searching for a diagnosis for 7 years. It’s one of those things not many people really know about yet, and we’re also finding out it’s not as rare as people thought. People just go undiagnosed for a very long time. My form of Mast Cell Disease is called Mast Cell Activation Syndrome (MCAS). Sometimes with this form, people think they just have really severe allergies, and it affects every body system because it’s technically classified as a blood disorder. The most difficult part about it is that your allergies change. One day a safe food could be something that causes anaphylaxis the next. You just never know. Mast Cell Disease has also caused me to have Dystonia, which is basically where I will have convulsions and my joints will pop out of place and get frozen. It looks like a seizure, but it’s not exactly a seizure. It’s almost worse because you’re conscious and you realize what is happening, you’re fully aware. It is really scary to watch and I’ve had many injuries caused by it. As of today, what are your allergies? Almost every vegetable, all nuts, almost every fruit, dairy, soy, corn, including corn syrup, we’re not sure about bread. I am allergic to yeast, so the wheat itself isn’t a problem but the yeast is. All foods that are high histamine are problems for me. Are you terrified to eat? Hah, well I have a very small list of safe foods. I’m actually on a special formula to get all my nutrition through a feeding tube. So right now, I’m not eating. I could eat by mouth if I really wanted to, but I’m relying on my tube right now. Can you have an allergic reaction to feeding tube formula? Yes, especially because I’m one of the more severe cases of MCAS that doctors have seen. I’m actually on a 24/7 Benadryl pump that was started after I spent 11 days in the ICU. It’s a trial procedure, but after 24 hours on the Benadryl pump, my seizures stopped and my anaphylaxis went away. I have had one anaphylactic reaction since being on the pump but it wasn’t my throat closing so I didn’t even recognize the symptoms at first. My heart rate was just at 140 for close to 2 hours, it was crazy. I ended up passing out and having a seizure. Do any of your family members have it, is it hereditary? Umm, I don’t think so. We have family members who have seasonal allergies but nobody has been like me. I have an 18 year old sister and 14 year old brother, and neither have it. As a baby I was constantly crying and unhappy. When my sister was born she didn’t cry and they thought she was the one that had a problem– it was actually me! They were just used to me crying so much that they thought something was wrong with her. How does your family support you? I’m blessed to have very supportive family, they’re always doing anything they can to make situations more comfortable for me and help me do things I can’t do on my own. Whether it’s keeping me entertained at the hospital or coming to the mast cell disease conference. It was crazy, everywhere you looked people were doing EpiPen shots and drinking Benadryl straight from the bottle! All of my sister’s friends came to support me at the conference, it was great. My family members are probably always on edge, but they are always there for me and are strong. My mom was so relaxed when I got my feeding tube because it meant I would stop eating and having anaphylaxis. She would be so anxious sitting at the dinner table when I would eat food. I think being the parent of a kid with special needs is probably the most difficult thing there is. Traveling is very difficult. Perfumes are hard to be around and can cause anaphylaxis, smoke can too. Anything can for me! Planes are kind of risky but I load up on Benadryl and my dog Moose flew with me last time I went to Boston to see my doctor. The last vacation I went on was Disney World over Christmas. I spent a lot of time at the rental house because I was sick and I had a seizure on Christmas day.You pretty much just have a good day or bad day, and you know right when you wake up which one it’s going to be. A good day would probably be going downstairs (giggles) or going to the movies. I don’t think I’ve been downstairs in four or five days now because I have had no energy and haven’t eaten in days. A good day also means no seizures, no fainting, and no anaphylaxis. I think the last good day I had I went to see my grandfather who is in the hospital and one of the nurses saw my mom and said “oh what room is Brynn in? !” She didn’t know we were just there to see him! It’s crazy to think about how much your life can change in such a short amount of time! 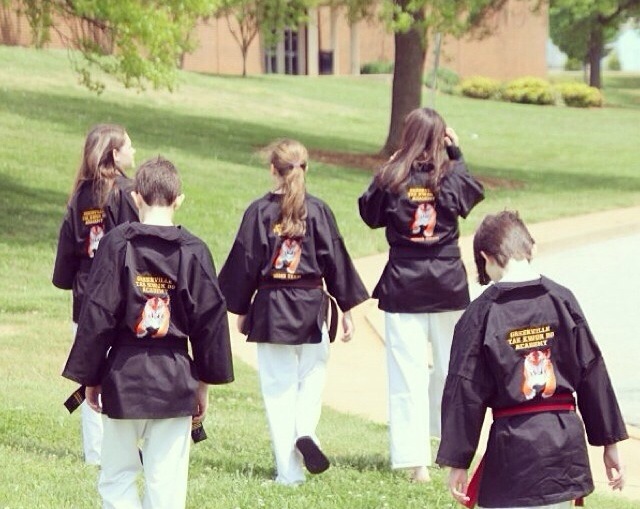 I used to be really active in martial arts- my siblings and I basically grew up in the Taekwondo academy. I started when I was nine years old and earned my first black belt at the age of eleven. By the time I was 17, I had earned my 3rd degree black belt and started training to become a Taekwondo instructor. Both of my siblings are black belts as well and I honestly believe that the life lessons we learned in Taekwondo have helped us more than anything when it comes to battling chronic illness. 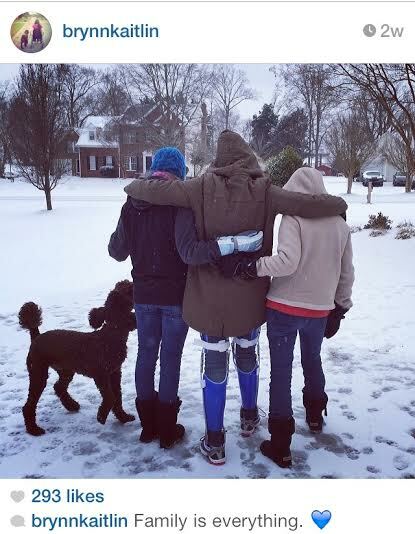 My family has been fighting with me through it all, and I would be lost without them. And what does a bad day look like for you? A bad day would be a family member having to keep their eyes on me 24/7. Fainting, needing help to do simple things like go to the bathroom. Doing everything possible to avoid the hospital. Sometimes I’ll have anaphylaxis but I’m so used to it that I’ll say “oh, I don’t need to go to the ER!” The more you learn to tolerate it and how to control it, the easier it is to avoid the hospital. I cannot imagine being in anaphylactic shock and staying as calm as you seem to. That is incredible. It never stops being scary, but I have gotten to the point where I don’t panic anymore. I know that the medicine will work, and I will get through it. I just have to get through it and be patient. Are there any doctors you see now who don’t believe in your diagnosis because of its rarity and sometimes bizarre symptoms? I have had some instances of that. Awhile back in the ER a doctor said “you don’t have mast cell because your blood work doesn’t make sense for that.” Meanwhile I’m seeing two of the top doctors in the country for this disease so they probably know what they’re talking about. You know so much about the disease, and seem to know a lot about health and medicine in general. It’s obviously something you’re passionate about. Have you ever thought about going to medical school? Actually, yes! I was in a biomed honors program at the career center [in high school] for 3 years before they kicked me out because I was missing labs… because I was in the hospital so often. I wanted to be a doctor. Then everything got crazy, but I did know a lot about the human body before I was diagnosed. I think that really helped me to learn more about my disease and understand it. There are so many people who have diseases and just basically know the name of their disease and not the details of it! It’s good to know more about it, and figure out exactly why you have it. Is medical school still a dream of yours for the future? I think it’s something that if I get to a stable point physically, I would love to do. As far as right now goes, I have kept myself from getting my hopes up. I’d also love to get to the point where I can adopt a child with special needs. I know that sounds crazy with all I have going on, but I really want to! I went to school with kids who had Down syndrome and they were my favorite people. So that is a big hope of mine– I’d love to adopt someone with Down syndrome. What do you think is the most difficult part of having Mast Cell Disease? I think I was supposed to have this disease so I can help other people. I’ve even been able to lead a few people to diagnosis! In the early stages, I couldn’t figure out why I had to be admitted [to the hospital], but after I got to my room I met someone who I was able to help because she has weird health things going on too. I’m supposed to help people, and that feels really good. 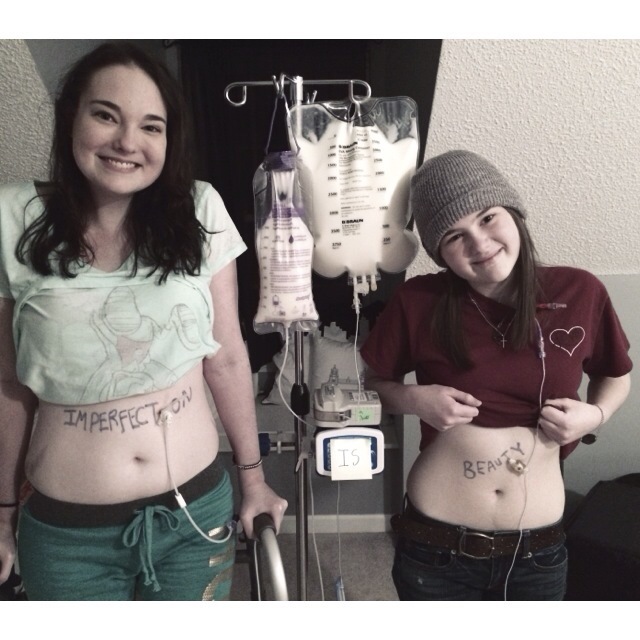 Brynn and Michaela found each other via Instagram and discovered they were staying at the same hospital! How long did it take you to reach that level of acceptance? Awhile (laughs). I really figured it out last year. I met people on Instagram who are also sick teenagers. I realized that the people who have become my best friends I would never have met if it weren’t for this disease. The day I had my first feeding tube I wanted to pull it out, I hated it. If I hadn’t met my friends who told me it will get better I would have pulled it out. But I didn’t, and now I can help other people do the same. I think everything plays out the way it’s supposed to. It’s easier to accept when I am able to help people. That is what is most important to me, even just being able to help one person to a diagnosis. I went seven years without one and it makes it worth it to help others.Everyone has something they have to overcome; Mast Cell Disease is just mine. What are the specific challenges of having an invisible illness? Probably one of the hardest parts is for teenagers like me. When I was in school I was missing so much class and my teachers didn’t believe that I was actually sick. That is probably the biggest thing. Also, finding a diagnosis when you don’t look sick. 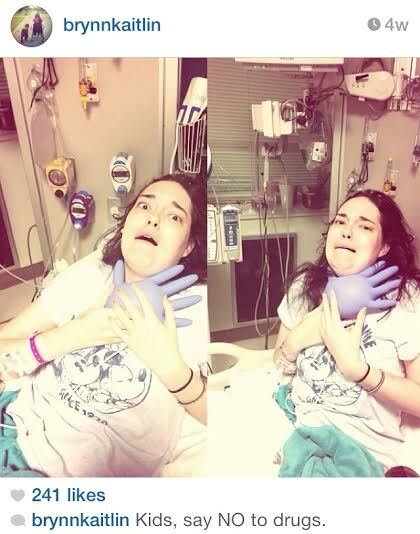 One of the few times I actually looked bad was when I was in the ICU. I can look fine but when you take my vitals they will be off the chart crazy. People have even thought I was a hypochondriac, and that is really difficult. Nobody chooses to have this disease. What is your prognosis? Do doctors see your disease as something that will improve over time, worsen, or are they not sure? That’s something nobody knows. As of right now I’m one of the sicker patients that the specialists have seen. But who knows, they may come out with miracle drug for people with Mast Cell Disease. It just takes one amazing thing to happen before everything changes and falls into place. Another favorite quote of mine is, “the reason people find it so hard to be happy is because they see the past worse than it was, and the future less resolved than it will be.” When I was diagnosed I thought my life was over, but there is good coming out of it. You just have to find it. I’m baffled because I feel like I have a pretty extensive knowledge of health conditions, yet I’ve never heard of Mast Cell Disease until talking to you. I’ve asked several friends in the medical field, and none of them are familiar with it either. Why do you think more people aren’t aware of it? I think it’s so unheard of because there are so many different factors and organ systems involved and affected. Doctors will find multiple different issues going on and organs having problems, but they can’t pinpoint a root cause. They don’t know what is causing it. How many hospital visits do you average per year? In 2012 I had 30 hospital admissions, and several ER visits on top of that. Sometimes one visit turned out to be a two week stay. In 2013, I had 8 admissions which was a huge difference. This year, I’ve had three so far. The difference between 2012 and 2013 was that I started seeing mast cell specialists. Those two doctors got me to a more controlled point. In 2012, I was passing out every few seconds; sometimes it would be 40 times per day. We attributed it to the POTS I also have, but doctors decided to look at my adrenal glands. They completely stopped functioning from getting too many rounds of steroids. I was getting 125 mg of steroids every single hospital admission and they basically killed my adrenal glands. Because I was getting the steroids at the hospital, my body stopped producing the “steroid” in my body naturally. So now I’m steroid dependent, and I have been slowly tapering off. There was one point where I was on 80mg every day but now I’m on smaller dosages. I’ve never been able to get completely off of them though because every time I have an anaphylactic reaction, they have to give them to me again. You mentioned you have POTS? What is that? POTS stands for Postural orthostatic tachycardia syndrome. It is an autonomic dysfunction, and it means with change in position your heart rate increases significantly so I can be lying flat and my heart rate will be that of someone who has just run a marathon. Right now I’m not on anything to treat it because I was allergic to the medication, but they also treat it with lots of IV fluids so that’s what I’m doing now. Have you ever had to seek counseling to deal with MCD, and your other medical conditions? It must take an emotional toll on you. It does take an emotional toll, but thankfully for me, I guess my perspective changed so much. 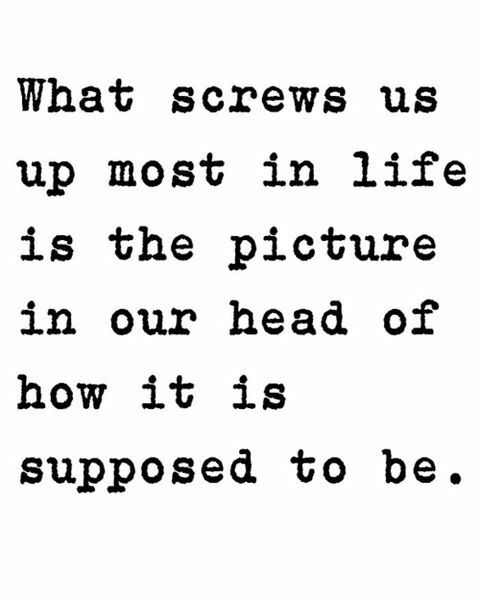 I don’t want to say it’s a “screw it” mentality, but I do have the mentality that everything is going to happen the way it’s supposed to. My doctors would send me to a counselor, and the counselors all said “I don’t think she needs to come back. Call me if you need me.” I’ve been able to keep it from controlling me, even though it’s hard. You just amaze me. On your own you have been able to get to a point of acceptance and optimism and hope that took me years and hundreds of dollars in therapy bills to achieve! And your medical issues are obviously much more serious than mine. So, you’re over the point of feeling sorry for yourself? Thank you. And, yes. I definitely have my days, but most of the time not. I was so oblivious to things going on in the world, but since my diagnosis I’ve had such a perspective shift. This disease, It’s been a really good thing to open my eyes about what others are dealing with. Speaking with you and seeing your pictures on Instagram has given me quite a bit of perspective, you deal with so much on a daily basis that many people never have to deal with in an entire lifetime. How do you stay positive, especially when you see people complaining about trivial things like a rainy day ruining plans, or having a cold? It depends on day, really. For example, everyone was complaining about cabin fever with the snow recently, and I was thinking “if only they knew.” But at the same time, they don’t really know anything different. I used to be the same way so I can’t blame them! A big part of it for me is just finding humor where I can. I like finding pictures that I took on my phone when I was drugged in the hospital and don’t remember taking them– that is really funny to me. My family helps me find humor in those situations too. When I got my leg braces, we went to the movies and I was hoping I didn’t see anyone I knew, and my sister said “why are you embarrassed? 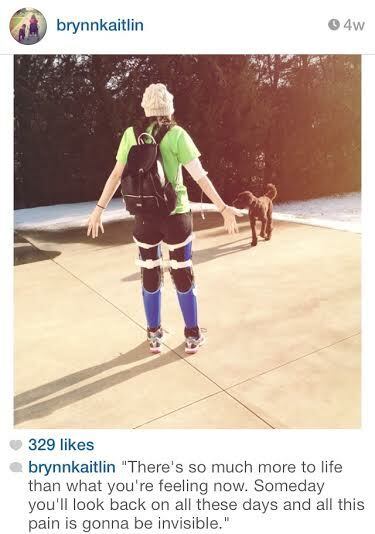 Do you not realize you have cool bionic legs? ?” I realized, yeah, that’s right! I then started humming We’re Off to See the Wizard and was calling myself the tin man! 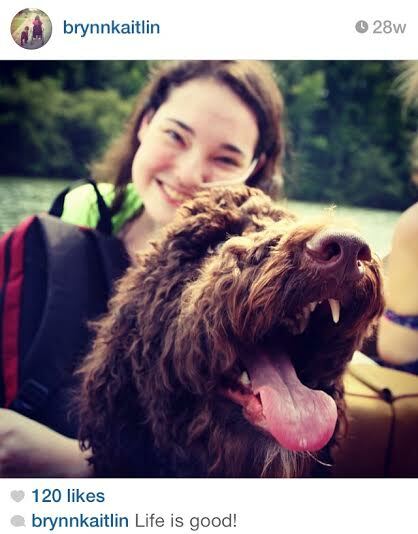 I love the fact that you have a chocolate Labradoodle as a service dog! Tell us about your companion. Moose is basically the best thing that has ever happened to me. The story behind it is pretty cool. After our previous dog died and I was homebound, I started begging for a dog. I would go through Google images and had complete puppy fever. 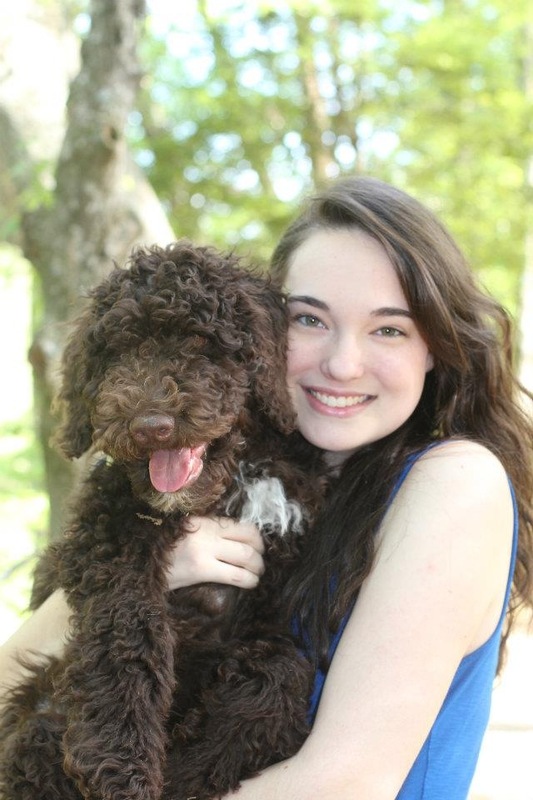 I am allergic to most animals, but Labradoodles are allergen friendly and I told my parents I really wanted one. My mom called around to different Labradoodle breeders, you can’t typically rescue them if you want to make sure it’s going to be 100% hypoallergenic. A couple had gotten a dog and didn’t want him anymore, so my parents got him and surprised me, he was 10 weeks old when he came home. Didn’t want him anymore!? That’s so odd, but it worked out for you I guess! I know! I honestly think he was just supposed to be with me. Everything changed when I got him, I was so much happier. When I got Moose, I became more outspoken about the disease, he gave me confidence to be myself, and he gave me peace of mind. I knew he was always going to be there in case something happened. When did Moose start alerting to your medical issues? We don’t exactly know when he started alerting because we are stupid humans, we didn’t know what he was doing at first when he was alerting! He started alerting probably around 4 months old, and we didn’t even know what he was doing, he just started doing it on his own. When I started going downhill, he would go crazy and run around, bouncing off the walls. It was as soon as I would start getting bad, his mood changed. One time Moose kept pacing between me and my siblings, and he kept barking and backing up in my direction so my brother said to him, “what do you want? ?” He walked over to Moose and Moose immediately calmed down. When my brother walked away he got upset again and he started pulling on his pant leg to come back to me. He wanted a human to be with me, to sit by me to make sure I was okay. We figured out he was really special when I passed out once and my family was on the other side of the house. Moose went to my mom and brought her to me in the middle of the hallway where I was lying unconscious. It was then that we decided to do service dog training with him to work on his dog manners, but he did initially start alerting on his own. Now he will alert me by laying on me or gluing himself to me when I’m not doing well. Even when paramedics are there they have put him in another room because he won’t get off of me. Have you ever sought alternative medicine or holistic treatment to help with Mast Cell Disease? We have! For me, it meant going on the low histamine diet. Unfortunately it didn’t do much because of the severity of my case but I’ve heard it has done wonders for other people! What advice would you give to someone who is struggling, whether it’s with a mental, emotional, or physical disease? The first thing I would recommend is reaching out to meet other people like you. It helps you realize you’re not alone and there are other people like you. That is the biggest piece of advice I could give—besides not letting yourself get caught up in the disease. I know for awhile, everything about my life was Mast Cell Disease. I would introduce myself and immediately say “I’m Brynn, I have Mast Cell Disease”, but now, I’m just Brynn. When you’re dealing with chronic illness, it’s easy to get caught up in everything negative going on, and people forget there is life outside of what they’re battling. Don’t let your illness define you. But at the same time, I know I wouldn’t be me without the disease because of how much it has changed me. And I mean that in a good way. Of course I hate the disease, but I also think it may be the best thing that has ever happened to me. I was so oblivious before I got sick, I didn’t realize the types of things people deal with. A lot of people think the world revolves around them, and they forget what is going on outside of their lives. Some people get offended when you say “it could be worse”, but it really could be. For example, I have this disease but I also live in a great city with a really good hospital where I’m treated. I’m so fortunate! That state of mind helps me. I have also met SO many people from Instagram alone, I’ve made so many wonderful friends. I wouldn’t have Moose if I didn’t have this disease.It has changed me in more good ways than bad. If someone is searching for a diagnosis for their medical issues and is wondering about Mast Cell Disease, what should they be on the lookout for? Weird rashes, spontaneous allergic reactions, low blood pressure, high blood pressure. If you have really bizarre symptoms no matter what they are, just look into MCD. It’s a blood disorder so it causes issues with every body system, I think that’s why it is so hard to diagnose. They were able to confirm my Mast Cell Activation Syndrome by blood work. It’s a complete specialized testing, if you don’t go to a MCD specialist you can’t be guaranteed it’s going to be done correctly. Small things, like if the blood isn’t sent on the right amount of ice can make your test results skewed. They diagnosed me by taking blood every single hour when I was in the hospital because my levels can go from normal to off the charts high, to normal again in just 45 minutes. You have to catch it in the peak of a reaction or else you won’t know what’s going on. This disease comes and goes in flares. I’ve had symptoms from birth but I’d go years seemingly healthy, then get sick again. Each flare lasts longer and is worse than the previous time. What I learned from Brynn is that you can always choose to be happy and appreciate your life, even if it means completely reinventing it and letting go of what you thought it was going to look like. Brynn learned to love her disease, something that was surely no small feat. What can you learn to love in your own life? I think it’s an important thing to take note of your struggles and learn from them, whether they are physical, emotional, or mental. They can either define you in a negative way, or you can grow from them. Brynn chose the latter. We all gain strength from each other, and realizing how fortunate we are to have the lives we have is key to happiness and acceptance. Check out her website, it’s currently under construction but will be up and running soon! What a heartbreaking story. I have heard this so many times before to varying levels of severity over the last 8+ years. The low histamine diet is great and has helped many. They are also on a sugar and gluten free diet to minimize any inflammation that they have. Some have gone to the paleo diet with some success but others it was not for them. Everyone is different with this because our immune systems have had to deal with different pathogens over the years. Have you received the HPV vaccination series? If so, what were your reactions right after vaccination? How soon after vaccination did you notice flu-like symptoms that did persist? YOU NEED TO STAY STRONG..MY DAUGHTER AND I HAVE THE SAME MAST CELL DISORDER. DON’T EVER GIVE UP…YOU SOUND VERY STRONG AND WISE.THANK YOU FOR YOUR STORY…. Congratulations on this eye opening interview with a sufferer (the lovely Brynn) of this chronic life threatening illness. Fantastic blog Ujuh! I wish you much success with all your endeavors in life…BTW thank you for stopping by and liking my post! This is amazing work, Courtney – you’ve shared a beautiful person with the world. Thank you! Thank you so much for reading! She has truly shifted my entire perspective and I feel honored that I was able to share her story. I have to say I got real emotional reading this…wasn’t sure whether to cry or smile at the positivity of this young lady. I am humbled by this. Sometimes we pass through difficult situations and think that’s the worst in the world, but there are people out there who have greater trouble and yet smile…oh laugh in the face of it. I have found a new meaning to life. Thank you Courtney for sharing. I hope Brynn gets healthy soon and live a happier life. I know exactly what you mean– I felt the same way when talking to her. You want to be happy and rejoice because she is so wise and has such great perspective, then cry for her struggle. I am so happy you gained something from her story, that is all Brynn wants after all 🙂 Thanks for your heartfelt comment, I know it means a lot to both of us! This is one brave girl!! A real life hero! Reblogged this on Ideals of Living. Very eye opening post! The vulnerability and courage it took to share is incredibly inspiring. Thank you for reading and for your comment– I agree with you wholeheartedly. 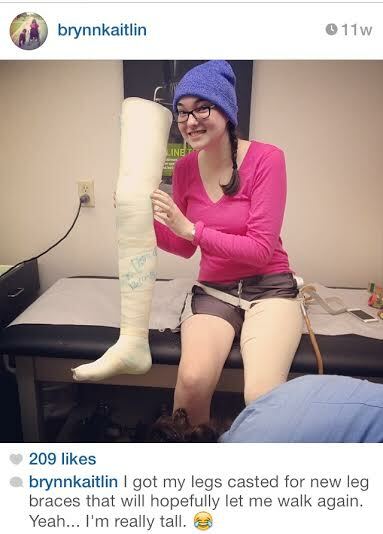 Brynn is incredibly inspiring and courageous! She amazes me every time I talk to her. Great post! You have a unique ability to write about a rare disease, not only presenting how and why it occurs, but how this disease affects a person. This last part is often missing in medical textbooks. Thanks! Thank you so much, Johnathan. It was a challenging post to write because I wanted people to see her suffering & strength, and understand how debilitating a disease it is. I’m so thrilled to hear your feedback. Thank you! This story is full of journalistic integrity that we sadly don’t even get through true “news” stations or papers. You’re incredible for writing this piece from a journalistic standpoint, yet your warmth and heart and understanding for Brynn shine through. Fantastically poignant. Great Job. And Brynn, what can’t be said that hasn’t already? You’re an amazing girl, and your courage is overwhelming. Even though I don’t know you, I wish you all the best. Kevin, I cannot tell you how much your comment means to me! I truly enjoy getting to hear the stories and experiences of others, learning from their wisdom, and sharing with others! Hmmm, if only there were a job where you interview people and write about it, hah! 😉 I truly appreciate your thoughts, they help encourage me to continue on this path I seem to be heading down– one of connecting with people and telling their stories. I’m going to keep at it. And Brynn has been reading these comments so I know yours touched her too. She is an amazing girl! I love love love The Secret, and try to live my life that way. I totally agree, she has embraced it and will be cured someday because of her positivity. Are you familiar with Byron Katie at all? Brynn’s attitude is very much on par with Byron Katie’s philosopy– loving what is! As someone who has lived with a rare disease for the past ten years (neurofibromatosis type 2), I can attest that this is 100% true. I would not be the strong, self-assured person I am today if not for my medical problems. In the end, we all have our problems, and how we choose to deal with them makes us the people we are. I just read about your rare disease, I’m so sorry you have to deal with something so difficult. Isn’t it amazing how a debilitating disease can make you YOU, though? I’m glad to hear you have chosen, like Brynn, to become a better, stronger person because of your struggles. Thank you for sharing, and I hope you continue to be the encourager and strong person you are! Amazing article, both by the interviewer and interviewee. It was a brilliant idea for you guys to write this article. I was so touched. Having had health issues myself lately – which are entirely negligible, especially in comparison to this – reading about such acceptance and positivity in the face of it is inspiring. Thank you so much, Kelly! Brynn was so easy and fun to talk to she made my job easy! It felt like one of those job interviews that turns into a 3 hour talk about your kids, favorite restaurants, and ex-boyfriends, haha! I am so happy to call her a friend now, and am thankful we met! I know what you mean, too. I thought my allergies were bad, but now I can’t believe I thought I had it so bad. 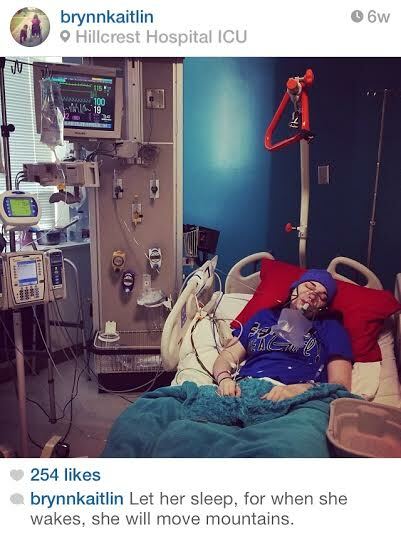 While I hate that Brynn has to suffer with her condition, I am so glad she is willing to share her perspective so we can learn to be more thankful for what we DO have. I hope you are well too! Thanks for reading. Wonderful interview! I was really inspired by Brynn’s attitude towards the challenges in her life – especially one that involves so many hospital stays and medical scares. I’m so glad I was able to learn about this rare disease. Thanks to both of you for sharing! Thank you for reading, Melissa! I am so thankful she was willing to share, too. Wow, my allergies are mostly to antibiotics, but I consider myself lucky. There was a girl I knew in high school who was allergic to so many foods. She disappeared for three months, and when she came back she said she was hospitalized. She’d gotten braces and turned out she was allergic to them too, but they couldn’t find the cause for so long. I wonder if she had MCD. Anyway, Brynn, you inspire me. Keep up the good fight! I have the antibiotic allergies too, Heather! Brynn and I were talking about how scary that allergy is. Because sometimes things happen and you just NEED them. Thankfully I have avoided them for the past 12 years, knock on all sorts of wood. I hope you have been able to avoid them too! That poor girl, allergic to her braces?! Nothing surprises me anymore. Especially after Brynn opening my eyes! It does make me wonder if she had/has MCD, interesting. Thanks for sharing! Wow, this was a really eye-opening interview. Before I read this, I thought my allergies were bad. I admit I had never heard of this disease until now. Checked out her blog, and will definitely be following it! Thanks for sharing! I completely agree, Eric. Reminds me of that quote, “if we all threw our problems into a big pile, we would grab ours right back”, or something along those lines. I thought my food/environmental/pet allergies were a major bummer…and then I discovered this disease. I am now completely thankful for my allergies, and that I only have as many as I do! Thanks for checking out her blog, I know I am looking forward to her posts! Your comment made my day, thank you so much!! It was really a fun post to write, even though it was about a heartbreaking topic. It was probably because it was so fun getting to know Brynn! With her attitude, you would have thought we were discussing our favorite movies and vacation spots– she is so positive and full of light it just rubs off on you. I’m so glad you could sense her radiating attitude through the post. It was easy for me to see because I got to video chat with her for several hours, so I was hoping others would sense that. I also believe we were meant to find each other. I can’t thank you enough for taking the time to read and comment. You have been very encouraging! Reblogged this on Twisted Brain. My wife and I empathize. We nearly lost our Grandson, Michael, to a brain tumor at the age of two. He survived it with chemo and stem cell treatment. I blogged on it and somehow he was the miracle. Twenty three went into treatment, three survived. It is ten years later. He is still okay. But it was many nights of tossing and turning and asking questions one should not have to ask. I see a smiling face and that is part of the battle. The smile and humor seem to help. Wishing you the best , The Waxes. I cannot imagine how scary and painful that time must have been for you and your family. I am so happy he survived it and is doing well today, how amazing! What a blessing. I’m sure that experience changed your family– do you all just love and appreciate every single moment with each other? We take it one day at a time and quite frankly avoid going back to the discussions during that time. It is now a distant memory. But we do appreciate life more and feel the idea of not taking life for granted. Yeah, it’s finally up! Congrats again! Thank you Ben!! Your support always means so much to me! I’m just glad that we got to see what an amazing girl was. Wow, Brynn is such an inspiration, a testament to how strong and resilient people can be while faced with extraordinary challenges. Thank you for telling her story! I completely agree, she has been a life-changing person for me to meet! I feel so lucky to be able to tell her story. Thank you for reading! I’m glad you found it inspiring, Brynn is very inspiring to me too! Thanks for reading! What if you were allergic to almost everything? What if some days you could eat something and be fine, and the next day you find that food sending you to the hospital? Mast Cell Disease is a real and very serious disease that needs more awareness! My sister conducted an amazing interview with a girl suffering from this disease and her outlook on life will amaze you. Thanks for sharing and your commentary, Char! This is an amazing interview conducted by my friend Courtney. The story is both informational and inspirational. Thank you so much for sharing, Gil! Please read this! I’m friends with Brynn’s little sister, Hannah, and I have been amazed at how strong Brynn is. She is an inspiration to us all, and I respect her so much for her courage and attitude. This is an incredible post and interview. Thank you both for spreading knowledge and providing inspiration to us all. Thank you for taking the time to read it, Kelly! 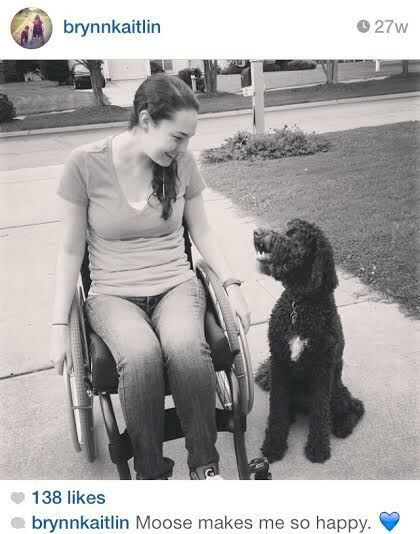 Brynn is such an inspiring person– she has completely changed my perspective which I thought was already pretty good. Turns out I had a lot more to learn from her. Thank you so much for the lovely interview – she sounds like an amazing girl. 1 – It actually may run in families, but doctors don’t know yet. They are finding signs that it does not run in families when they are looking at certain aspects of the disorder, physically. At the same time, it shows up in families with a higher prevalence than in the regular population. I have this same disorder, for example, and so does my daughter – the odds are significantly against that happening, with how rare this disorder is. 2 – There’s a saying in the community: some have spots, and some do not. While many people in the community have rashes and hives and constant anaphylaxis, there are a pretty large group of us who do not. Our mast cells tend to leak more slowly, so hives and shock take a lot longer to build up to, or in some cases don’t happen at all. In those cases, a person with a mast cell activation disorder can suffer from chronic pain (bone pain and headaches are very common), mental difficulties, exhaustion, gut problems, and other issues. They can react to just as many things, but their reactions are less severe. It can be debilitating and isolating, but it is not as physically taxing as Brynn’s experience. She seems like such a great kid. 3 – There are some amazing support groups on Facebook that have files in their files sections that are very good sources of information on symptoms, testing, good doctors, and more. Just searching for MCAD, MCAS, mast cell disorder, or mastocytosis on Facebook can find them. Again, thank you for such a great interview. I think of my daughter and I’m always hopeful that the more people know about it, the more chance there may be for a cure in her lifetime. This is all such wonderful information, thank you so much for taking the time to share it! I’m sorry you and your daughter both have it, but I can imagine you are able to support each other and understand each other’s struggles in a way nobody else can. I also am hoping to raise awareness on this disease– more people need to know about it. Thank you again so much for your comment, I truly appreciate it and I know countless others will too! My daughter and I have mast cell disorder and we can not find a good doctor, please let us know about your doctor. Thank you for sharing! I was just diagnosed with Mast Cell Disease two weeks ago. I have had two episodes of anaphylaxis, one needing ICU for over a week. its gotten better in that I haven’t had a bad flare up that ended me in the ICU since last year. But I am having more and more little flares ups. I appreciate that you did this interview because it is very hard for me to describe what I am going through with my family and friends! Thank you! Oh Jennifer, I’m so sorry to hear this. I am glad you reached a diagnosis, but I know it’s not an easy pill to swallow. I can imagine you are going through a lot of mixed emotions dealing with it. I know just getting people to understand what you’re going through is probably key. You are not alone!! Wow wow wow!!! What an amazing and inspiring girl she is!! Thank you for this interview, it was informative and eye opening. She is truly a hero! Thank you for reading it! I agree- she is a complete superhero. Funny you mention that because on her own blog she published a post today about heroes in life. She is totally one of them. I’m glad you gained as much from it as I did! 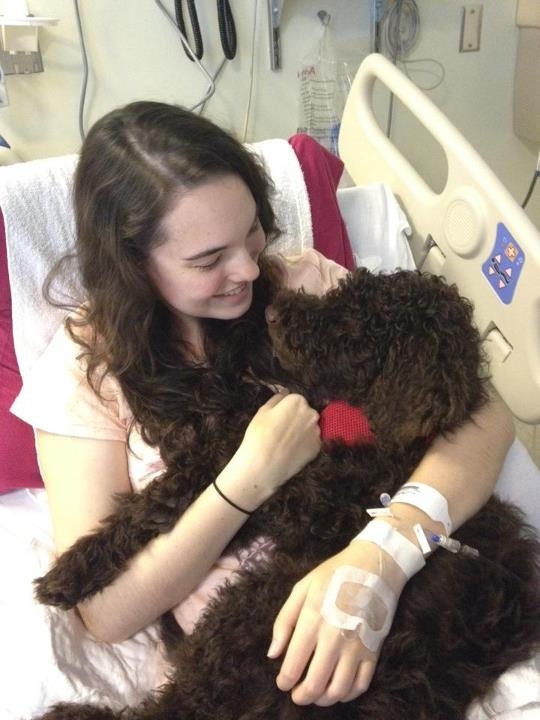 Brynn, I just left a comment but I forgot to tell you–I have a chocolate Labradoodle that looks just like your Moose! Joey is three and a medium size. I’m getting a minidoodle in a couple of weeks that should be apricot color, already named Frank 🙂 I’ll try to send you a photo if you like. Aren’t they the greatest?! My friend has Mast Cell Disease and this story has made me see it so much clearer. I’m so humbled by the strength and spirit. Thank you for sharing this. Thank you for taking the time to read it. Your friend is lucky to have you, someone who wants to understand her more, and someone who will empathize with her. Friends like you are priceless! When I was really sick and sitting in yet another waiting room waiting for a scan of my sinuses, I decided to read a magazine. That is when I first learned of Mastocytosis (a mast cell disease). Then when in Dallas a met a woman and her son who both had the disease. We can choose to be happy despite our illnesses or we can choose to be miserable. At some point in all my illness, I finally decided I was going to be the survivor and not the victim. How courageous Brynn is. Bless her and her family. Thank you for sharing this story. I am going to share it on my blog. Just like the allergies I suffer, we need to bring more awareness to these often overlooked and misunderstood illnesses. Wow that is amazing. Can you believe how you can meet such positive people with such daunting circumstances! You amaze me Brynn! That’s exactly how I felt, Ben. I also hate that it takes talking to someone with such REAL and legitimate struggles for me to have my perspective shifted again. Can’t I just keep this grateful, optimistic perspective all the time?? I guess that is life though. I can’t even imagine getting that sick from eating. I love food and would have such a hard time. And the hospital visits. That would be so hard too. Court, this is a fantastic interview/article! 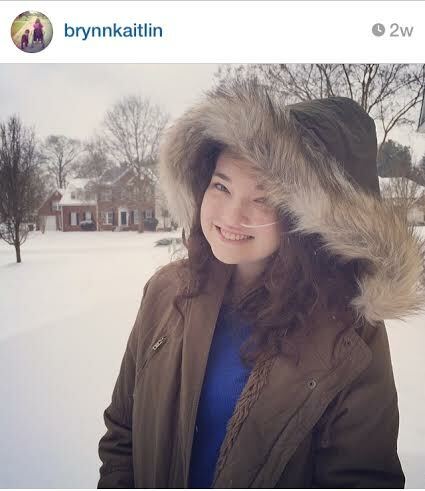 Brynn is an inspiration to all those living with chronic illness and an amazing young woman. 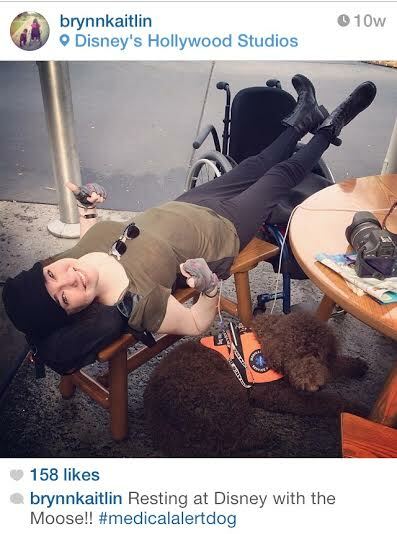 The fact that she also lives with POTS makes it even more personal to me. Thank you for spreading the word about MCD and sharing Brynn with all of us! Thank you, Heather!! She is such an inspiration, you are correct. Amazing! I guess I didn’t realize you have POTS? How long have you had it?? Thank you for sharing my story! It means so much to me and I am thrilled that we have gotten to know each other better! Thank you for telling Brynn’s story Courtney. I see no way a person could read this blog and not be profoundly changed for the better. Thank you Brynn for being so transparent and allowing your story to be told!! Oh, thank you for your kind words! I feel the same way, so I’m glad others can read it and feel that. It was one of the hardest posts for me to write because I wanted so badly for people to get the full effect of “all that is Brynn”- haha! I got to video chat with her and talk to her for hours and hours, and was so moved by her spirit and way of thinking. I’m so glad you were able to see it in this post. Thank you. Reblogged this on Brynn's Bubble.